The guy cannot put a foot wrong. 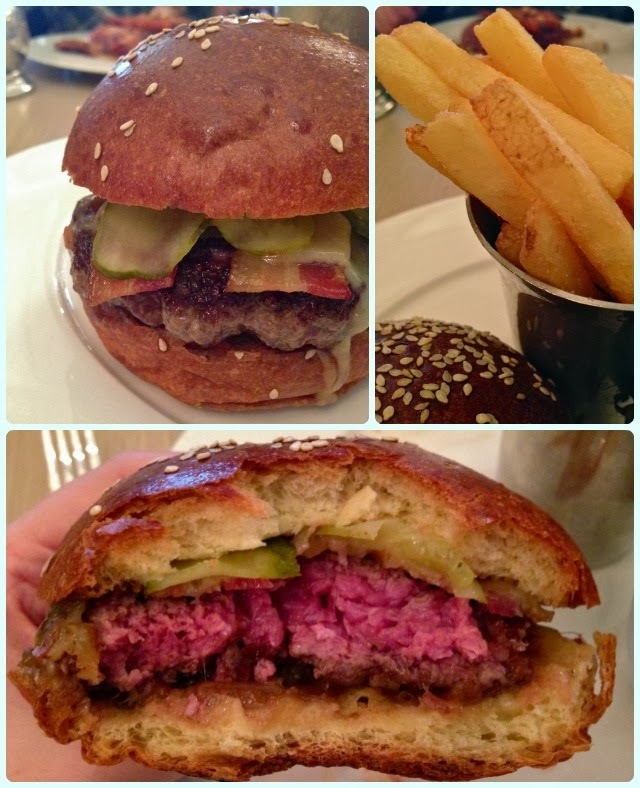 Our first ever fine-dining trip to London saw us fall in love with Jason Atherton's cooking. 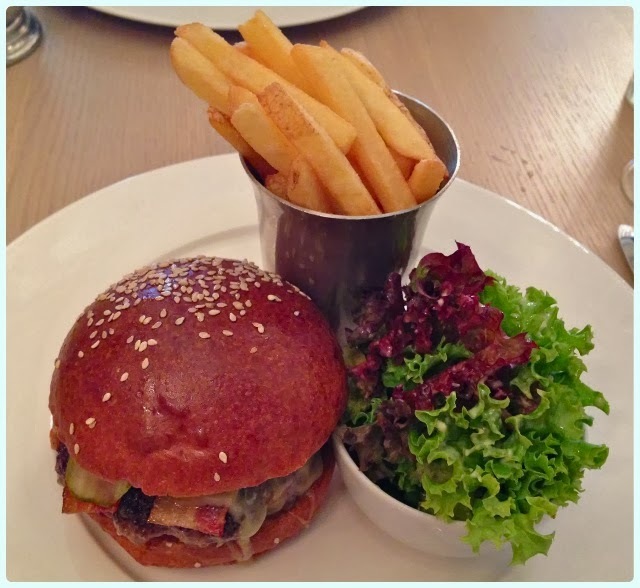 We planned to visit Ramsay's Royal Hospital Road, but in our infinite wisdom decided on a light lunch at Maze first. That turned into an eight course tasting menu, around another twenty plus at RHR later that night, and the very real threat of gout on the way home. 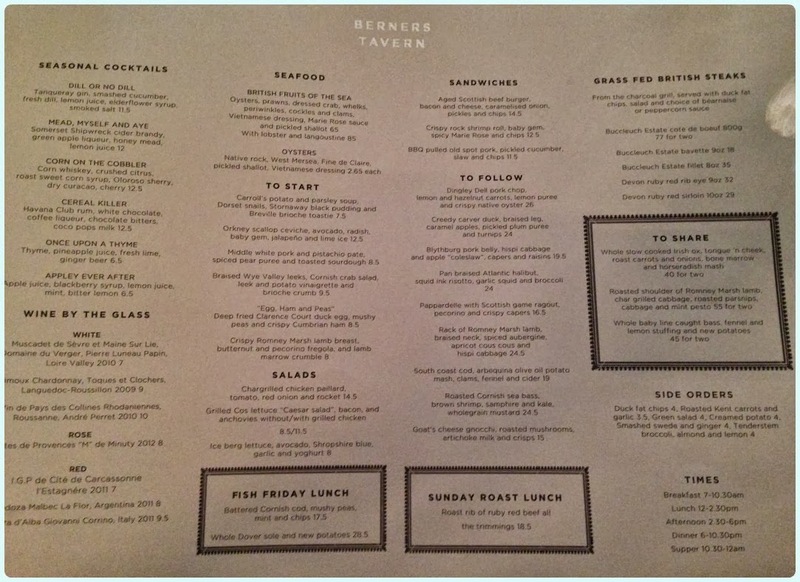 Since then, we have frequented Maze Grill, Pollen Street Social and Little Social in quick succession. We have never had a bad course from his kitchens, let alone a bad meal. I get the impression Jason isn't really too fussed with the pomp and ceremony required under the notorious Gordon Ramsay Holdings, preferring a 'smart casual' approach to his food. This is British cookery at its absolute best; simplicity is in charge, with the real skill being in the flavours. Think big. Berners Tavern is situated on a quiet side road off Oxford Street, in the plush Edition Hotel. There is a small lobby area as you walk through the heavy front doors, where you will be greeted by someone now well versed in how to deal with the many 'oohs' and 'ahhs' as you discover the opulent dining room. It is quite frankly stunning. Intricate plaster work covers the tall ceiling, and many different works of art adorn the walls. Everything has been finished to an amazing standard. This beautiful room was left unloved and empty for about seven years, and took an age to revitalise its former glory - the ceiling alone took two years! Before its grandeur was restored, the room bore the scars of many years of excess, with dirty walls, the stench of decades of cigarette smoke, battered fittings and a carpet so filthy your feet would stick to it. The present day attention to detail is just breathtaking. Not only is the room filled with beautiful things, but the speakers match the paint on the walls, and all the silverware was custom made for the restaurant by a local silversmith. 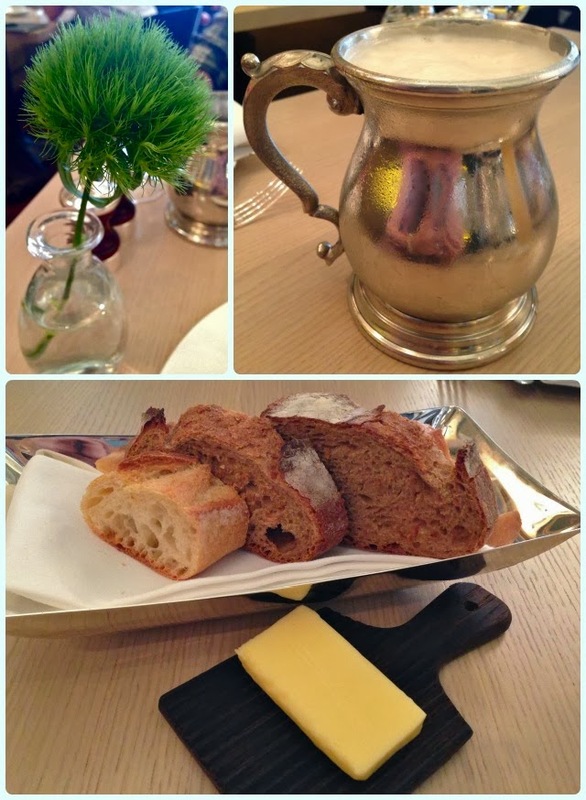 We were welcomed with a platter of bread and a drinks menu. Being a craft beer enthusiast, my husband was thrilled to see Anchor Steam on draught, which came in a rather fetching silver goblet. Harry Potter eat your heart out. He is now coveting his very own goblet... (my husband... I cannot speak for Mr Potter). I have added a photograph of the full menu, as I found it difficult to source it online. The restaurant has only been open for a couple of weeks, and there isn't much information on their website yet. Middle white pork and pistachio pate, spiced pear puree and toasted sourdough: this is a very hearty portion for a starter. 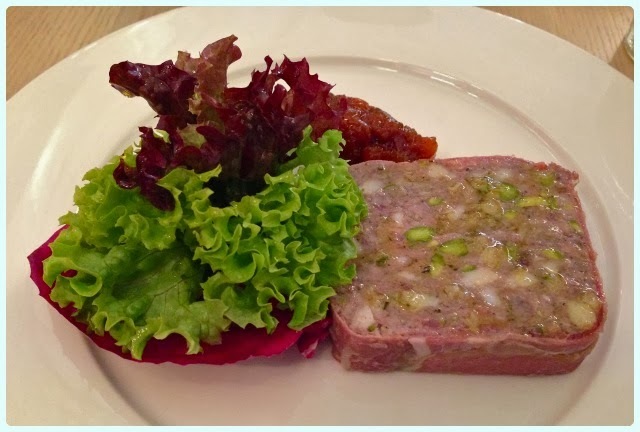 It's more like a chunky terrine, perfect for these chilly days. 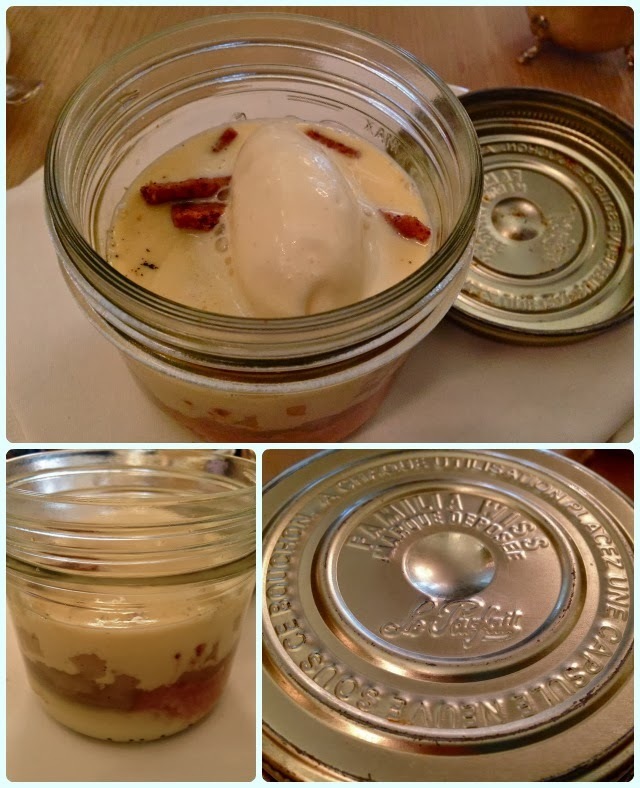 Wrapped in bacon, and served with a warming pear puree, this screams Autumn at the top of its lungs. The nuts added a subtle crunch and vibrancy to the appearance, and the pear brought out the natural sweetness of the meat. 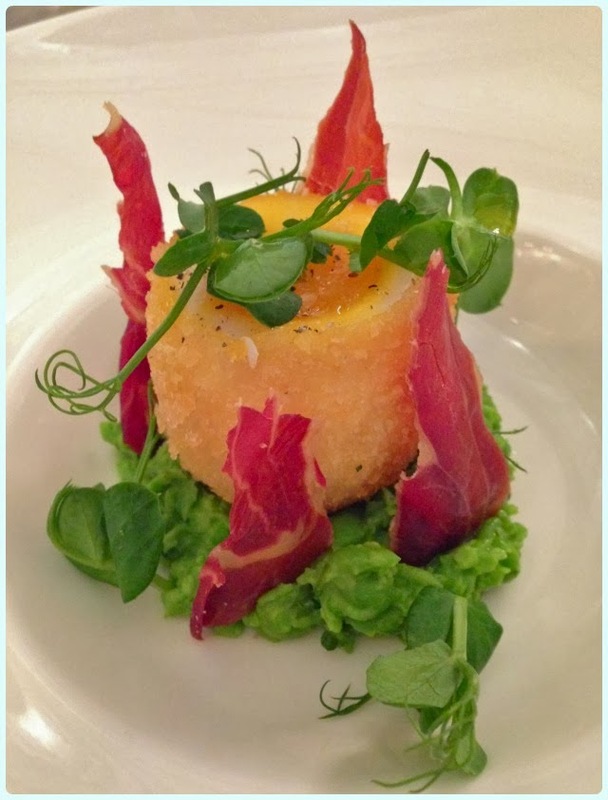 'Egg, ham and peas' - deep fried Clarence Court duck egg, mushy peas and crispy Cumbrian ham: pretty as a picture and exactly what my husband had hoped for. He had picked this dish before we even got to the restaurant. Aged Scottish beef burger, bacon and cheese, caramelised onion, pickles and chips: Christ on a bike. Actual burger perfection in my opinion! A soft enriched bun, juicy pink burger, and accompaniments in correct proportions. The bacon was crisp, cheese oozing and pickles were thinly sliced so that the burger didn't disintegrate on picking it up. 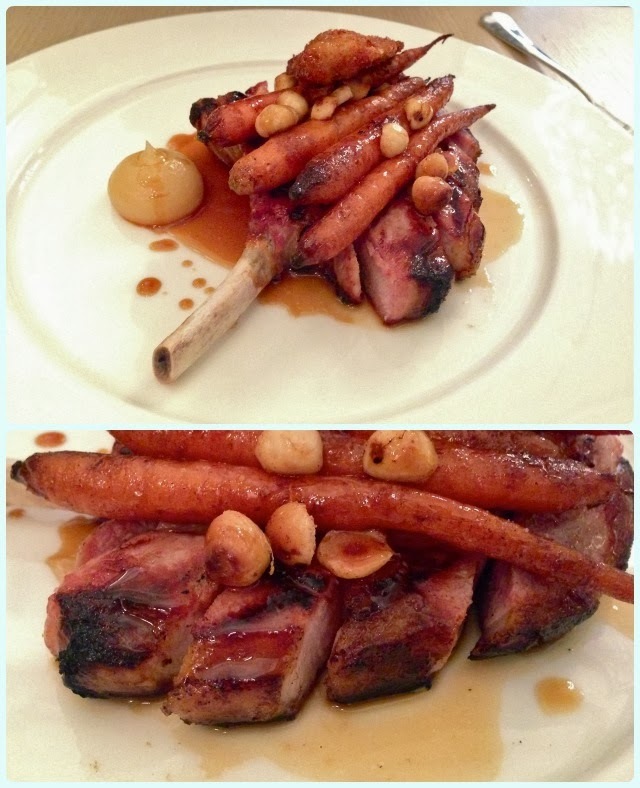 Dingley Dell pork chop, lemon and hazelnut carrots, lemon puree and crispy native oyster: a behemoth of a chop served with the best carrots in the west: slightly charred on the outside, but with a hint of bite on the inside. The sharp lemon puree was the perfect partner to the sweet nuts, vegetables and meat. 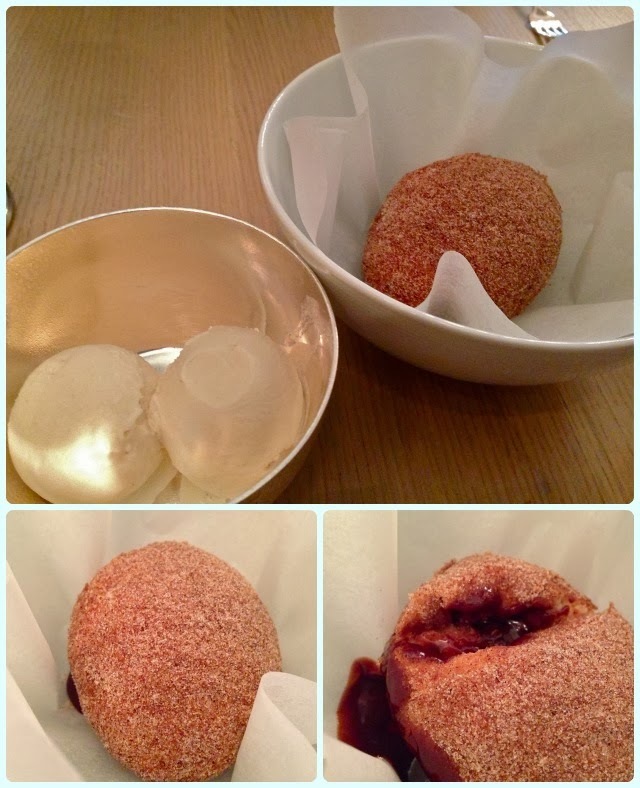 Chocolate filled donuts, cinnamon sugar coating, almond sorbet: rewind about fifteen to twenty years. Rivington and Blackrod High School, 12pm. You generally had a packed lunch, or found yourself stood waiting for turkey drummers and chips for lunch. There was only one thing on your mind: a choice... Aussie Crunch or a chocolate doughnut? We were both a little curious about this childhood favourite appearing on the menu. It was nothing less than spectacular. Crunchy cinnamon sugar on the outside, warm chocolate seeping from the inside. A thing of wonder. 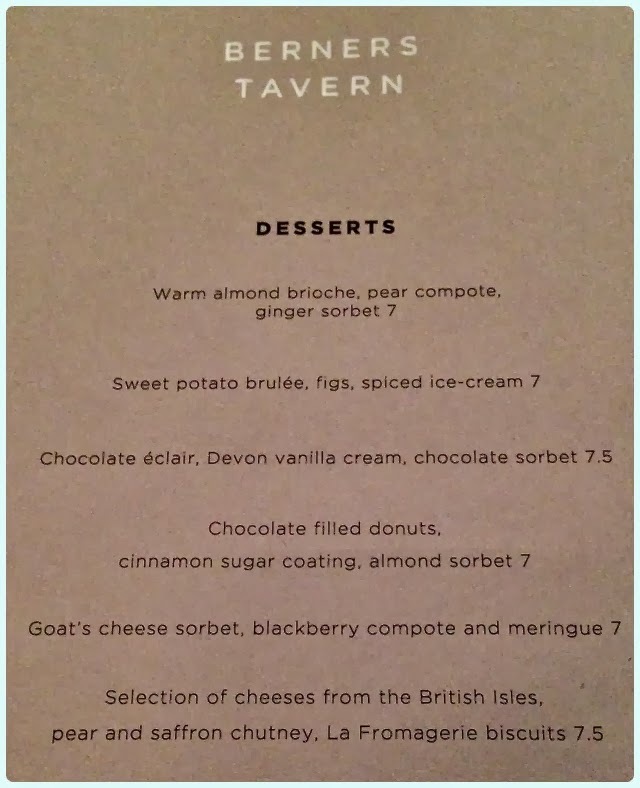 The addition of almond sorbet? Genius. Warm almond brioche, pear compote, ginger sorbet: I had seen one of the chaps on an adjacent table having this whilst I was still waging war on my burger. Layers of almond brioche, pear compote, firmer cubes of fruit and biscuit, all crowed with ginger ice cream... oh, then they come and tip home made custard over the top too. I ran the risk of it killing me, and lived to tell the tale. 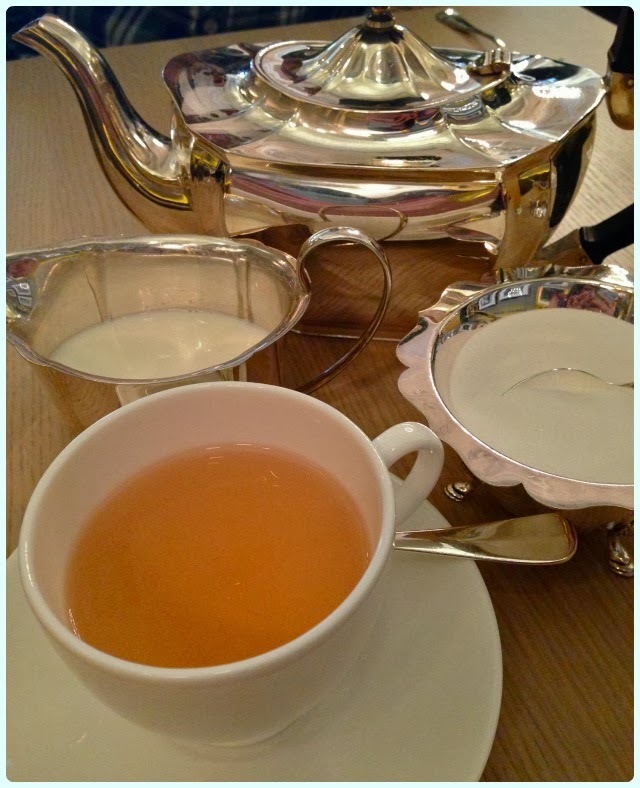 We finished our meal with a lovely cup of darjeeling, served from a rather elegant silver tea set. 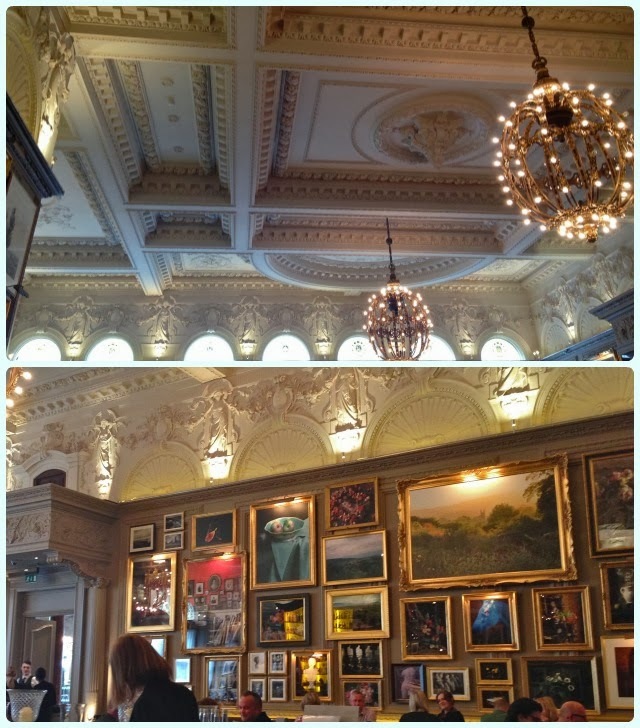 What a wonderful place Berners Tavern is. Not only is it situated in one of the most magnificent dining rooms I have ever come across, but the staff are passionate and knowledgeable, and the food is just fanfare-worthy. 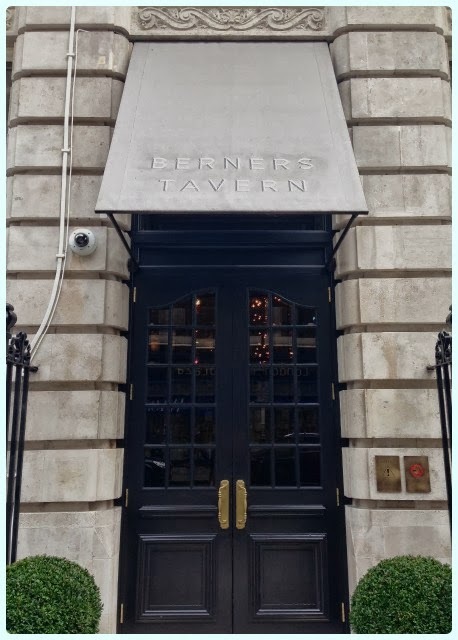 There may be silverware on your table, and fine art on the walls, but Berners Tavern is all about comfort. The food is bold, and not afraid to be so either. Another wonderful production from Chef Atherton.